Tensions between the US and China over the South China Sea, which have been rising over the past year, could spike dramatically in coming weeks with the outcome of an arbitration tribunal in The Hague, Netherlands. The case in the obscure Permanent Court of Arbitration (PCA) was initiated by the Philippines government which has clashed repeatedly with China for control of disputed islands and reefs. The Chinese regime is boycotting the court proceedings which it fully expects to lose. Alongside North Korea’s nuclear brinkmanship and the enduring India-Pakistan tensions, the conflict in the South China Sea has now become one of Asia’s major flashpoints. It is where the most direct confrontation between the world’s two largest economies and military powers is taking place. In this sense it has become the frontline in the unfolding ‘Cold War’ between the giants of the eastern and western Pacific. The conflict hinges on rival claims to uninhabited rocky ‘features’ – most are too small to count as islands – and control over the surrounding waters. The Chinese regime (CCP) claims sovereignty over more than 80 percent of the South China Sea, a claim formulated as the ‘nine-dash line’ – a u-shaped demarcation line that cuts southwards towards Malaysia. 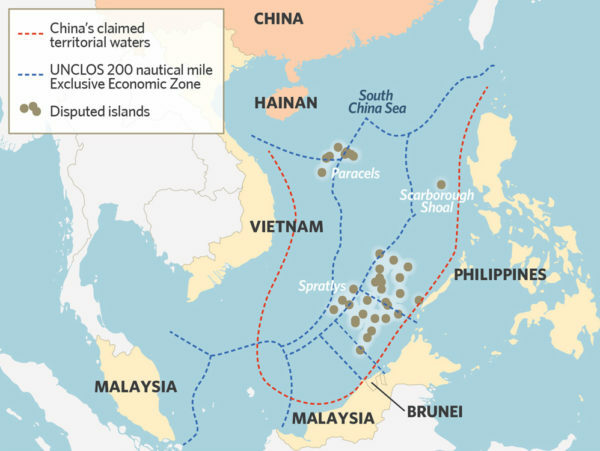 China’s claim overlaps territorial claims by Vietnam, the Philippines, Malaysia, Brunei and Taiwan. The two main island groups in the South China Sea, the Spratlys and Paracels (Nansha and Xisha in Chinese), are claimed in their entirety by Beijing. Vietnam also claims the whole of the Paracels (Hoàng Sa), while four other governments claim parts of the Spratlys. This is partly a scramble for natural resources, with significant oil and gas deposits underneath the seabed. The South China Sea also holds one-tenth of the world’s fishing stocks – upon which more than five million fishermen in China, the Philippines, Vietnam and other coastal nations depend. Armed clashes between fishing fleets and coastguards from the feuding nations are a frequent occurrence: Indonesia (in dispute with China over the Nantuna archipelago) and Taiwan have arrested Chinese fishermen, while Vietnamese fishermen have been seized by China and the Philippines. China’s nine-dash line claims more than 80% of the South China Sea. But more importantly the South China Sea conflict centres on its strategic position as the “throat of the Western Pacific and Indian oceans” in the words of US geopolitical expert and former Pentagon adviser Robert D. Kaplan. This is a scrummage for economic, military and political hegemony being fought between the US and China, followed and supported/opposed by a constellation of smaller regional powers. East Asia is a decisive region for global capitalism, accounting for over one-third of global GDP, where China has supplanted the US and Japan as the major economic power but now faces a determined pushback. China dominates trade across the region and even the closest of US allies such as Japan, Australia, South Korea and more recently India, all count China as their biggest trading partner. China’s two-way trade with the 10-nation ASEAN bloc was worth US$480 billion in 2014, more than ASEAN’s trade with Japan (US$229.1 billion) and the US ($216 billion) put together. ASEAN (Association of South East Asian Nations) members are Brunei, Cambodia, Indonesia, Laos, Malaysia, Myanmar, Philippines, Singapore, Thailand, and Vietnam – four of which have disputes with China in the South China Sea. The Chinese regime recently warned the US not to turn the South China Sea into a ‘geopolitical chessboard’, which is an accurate description. But Beijing’s actions have fed anxieties around the region and therefore ultimately facilitated Washington’s geopolitical agenda in Asia. Both camps accuse each other of ‘militarising’ the South China Sea – a classic case of pot versus kettle. The losers from this maritime turf war are the masses throughout the region who must shoulder an even bigger burden as military expenditure soars and right-wing nationalism makes advances. US policies to contain China and draw smaller Asian states into a pro-US alliance have been assisted by the missteps of the Chinese regime, whose foreign policy is shaped – more than in most other countries – primarily by domestic concerns. These range from the regime’s increasing dependence on nationalist propaganda as its economy falters, and the ongoing power struggle within the state for which CCP leader Xi Jinping needs to project a ‘strong man’ image. An important dimension of this is a major purge and shake-up within the PLA (military) general staff. Xi is using the South China Sea issue to cement his control over the PLA while also carrying out a programme of cuts to land forces, shifting resources to the navy especially, which is encountering strong resistance. Outside its borders these policies are stoking fears and providing ammunition for nationalist politicians to grandstand on an anti-China platform. As China’s economic problems multiply the struggle both within the regime and against its imperialist rivals is sharpening. In addition to boosting its naval presence and capabilities, Beijing’s strategy involves a construction drive (so-called island-building) to erect military or quasi-civilian facilities such as ports, airstrips and radar stations to consolidate its control over key points around the South China Sea. This is a policy US military chiefs have blasted as China’s “Great Wall of Sand”. Through this strategy Beijing seeks to establish a strategic buffer to check US power in the event of a future conflict for example over Taiwan. A scenario widely discussed in military circles is of a US-led trade embargo against China backed by a naval blockade in the event of Chinese military action against Taiwan. This echoes the policies of the Roosevelt administration against Japan in the period leading up to World War II. While China’s naval power has expanded rapidly, the US still wields crushing naval superiority. 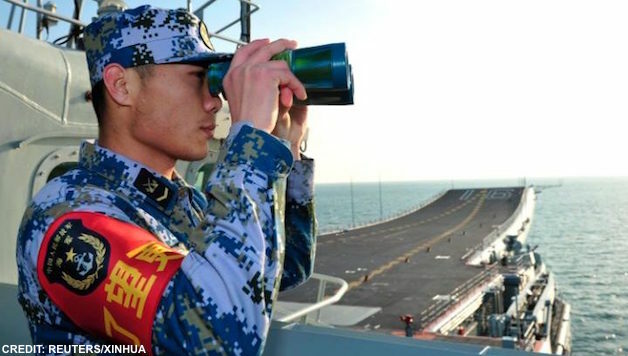 A recent article in US journal Foreign Affairs concludes that China, now the world’s second largest navy, will not catch up with the US in military terms for many decades, if ever. 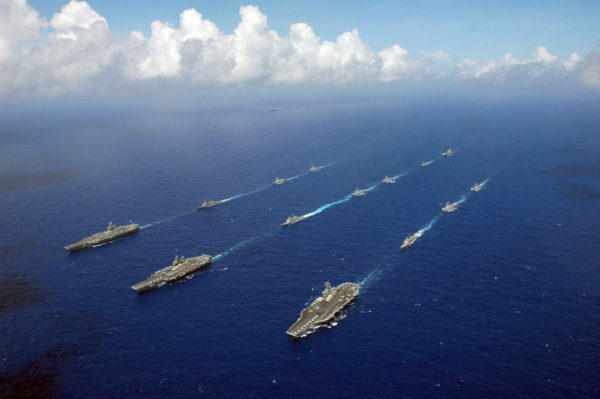 The US has ten aircraft carriers, which is more than the rest of the world combined (China has one). The US still enjoys a significant technological edge, although China’s naval forces have made advances based on massive investment over the past decade and a half. Given this mismatch, Beijing is attempting to level the playing field in its own ‘backyard’ exploiting what are – for all sides – legally ambiguous territorial claims. It calculates that the cost to the US in economic and political terms will over time tip the balance in its favour. This is why US spokesmen accuse China of a ‘salami-slicing’ strategy. In retaliation the US has stepped up its naval operations in the disputed waters under so-called ‘freedom of navigation’ exercises. At the same time it is encouraging ‘proxy’ states such as the Philippines and Vietnam to step up their defences against China. The US is counting on its increased military presence in the South China Sea and a propaganda offensive portraying China as an aggressor that violates ‘international law’ to force Xi’s regime to step back. The problem for both sides is that any concessions involve a loss of face with serious political consequences. These political factors ultimately overshadow the struggle for economic spoils beneath the ocean’s surface. For Xi Jinping any suggestion of a climb down over China’s territorial claims could feed into the internal power struggle and undermine his nationalist credentials. For the US, its authority as the Asia-Pacific’s preeminent military power is on the line. The reality of our epoch is that US power is increasingly constrained by economic and political factors, as we have seen in the conflicts in Syria and Ukraine. From its own standpoint, Washington can ill afford to show weakness in East Asia. 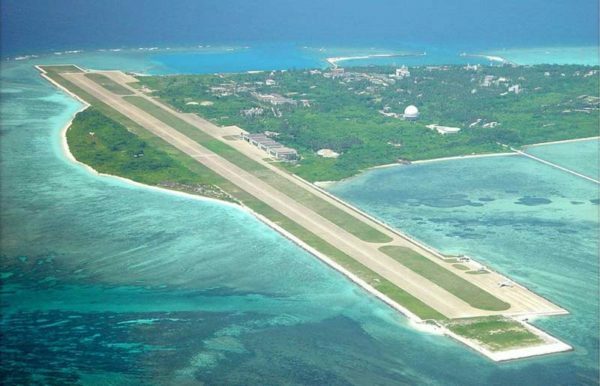 Airstrip on Chinese controlled Yongxing (Woody Island) in the Paracels. There have been tensions and even small scale military clashes between some of the antagonists in the South China Sea in the past, but the conflict today has assumed a different character as a test of strength between the two biggest superpowers. It is no accident that the conflict is sharpening as the global capitalist economy lurches from one crisis to another and nationalism and economic protectionism are on the rise. 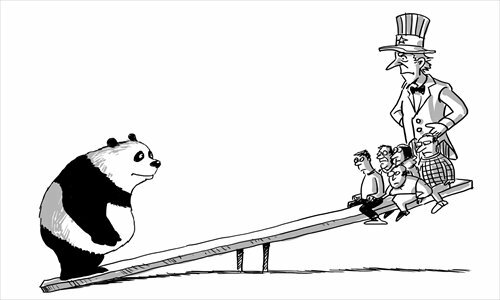 Sino-US relations are increasingly acrimonious with tensions flaring over a range of trade and economic issues. This is reflected very clearly in the US presidential campaign, most obviously by Trump’s attacks on China. But a Clinton presidency would also almost certainly take a harder line towards China. The first maps to show China’s nine-dash line territorial claim were published by Chiang Kei-shek’s nationalist dictatorship in 1947. These were also adopted by the CCP when it came to power in 1949 and established what it claimed was a ‘socialist’ regime, but in reality was a Stalinist – bureaucratically distorted – regime resting upon a state-owned economy. Its outlook was heavily nationalist (to defend the national interests of the ruling stratum) rather than internationalist, although it occasionally paid lip service to “world revolution”. At that time most of the other nations with conflicting maritime claims were occupied by foreign powers. As mass independence struggles developed and forced out the foreign imperialists, the CCP regime took a low-key approach to its claims in the South China Sea in order to establish friendly relations (not always successful) with these movements and governments. It is the process of capitalist restoration and China’s emergence this century as a superpower, along with the powerful development of capitalism and ambitious capitalist regimes throughout the region, that has changed the relationship of forces. The CCP’s more assertive stance and more vigorous pursuit of its nine-dash line claim is therefore a reflection of its economic transition into a global power with a major stake in the capitalist world market and the markets of its Asian neighbours. This also explains China’s military build-up and the Chinese state’s need to project power outside its borders. Chinese military spending has increased by 325 percent since the start of the century – the most rapid expansion by any major nation (source: SIPRI). US military spending rose by 70 percent in the same period, but from a much higher level. While China is engaged in a process of military catch-up, becoming the world’s second highest military spender in 2008, its still lags the US, which spends almost three times more per year than China (US$596 billion versus $215 billion in 2015, according to SIPRI’s estimates). Recognising its loss of influence in Asia, the US ruling class is pushing back partly on the economic front but primarily by revamping its military role in the region and positioning itself as the guarantor of ‘stability’ with China cast as a ‘destabilising force’. In 2011, the Obama Administration unveiled its ‘pivot’ doctrine, according to which the US is redeploying the majority of its global military assets to the Asia-Pacific. This is also backed up by an economic pact, the ultra-neoliberal Trans-Pacific Partnership (TPP), with twelve member countries under US stewardship. The TPP was launched earlier this year and despite official denials is specifically designed to exclude China. Summing up the rationale for the creation of the TPP, Obama wrote in the Washington Post (2 May 2016) that, “America should write the rules. America should call the shots. Other countries should play by the rules that America and our partners set, and not the other way around.” The US approach towards the South China Sea, while couched in more diplomatic language, manifests the same “we write the rules” arrogance. The US ‘pivot’ consists of establishing new US bases, upgrading military alliances, and also kick-starting an arms race (with big financial dividends for the US military-industrial complex), all with the aim of containing China. According to a forecast by IHS Jane’s, defence spending in the Asia-Pacific region will rise by 23 percent to US$533 billion annually by 2020, placing it on par with North America and representing a colossal waste of resources for a region with massive and pressing development needs. Japan, under the right-wing nationalist government of Shinzo Abe, has embarked on a new militarisation drive that departs from half a century of official ‘pacifism’. Support for Japanese militarism (which has its own territorial disputes with China in the East China Sea) is an important element of the US ‘pivot’ doctrine. But this is a potential Pandora’s Box, unleashing forces that the US cannot control. US policies could therefore backfire with catastrophic effects as they have in the Middle East over the past 15 years, igniting national conflicts and destabilising the region. US imperialism’s ability to wage war is constrained by mass opposition at home and the fragile state of its economy, which explains the extreme reluctance of American politicians to commit “boots on the ground”. Hence its strategy to contain China focuses on arms sales and a US ‘supporting role’ to proxy forces including some of the states involved in the South China Sea conflict. This does, as many commentators have said, represent the start of a new ‘Cold War’ between the two superpowers especially in the Asia-Pacific. But it is different – more complex – compared to the ‘Cold War’ between the US and Stalinist Russia in the past. Today’s opposing camps are less settled and stable; they are built upon shifting alliances with sharp divisions within the camps. In South Korea, for example, a US ally and base for 24,000 US troops, the resurgence of Japanese militarism as encouraged by the Obama Administration is placing increasing strains on their relationship. On the other hand, the election of Tsai Ing-wen of the ‘pro-independence’ Democratic Progressive Party as Taiwan’s president marks an important foreign policy shifts towards the US and away from China. The DPP government wants to join the US-led TPP in an attempt to reduce its economic dependence on China, although China will strive to block or drag out this process. The US is preparing more military sales to Taiwan and pushing the island to develop a stronger military industry, further antagonising Beijing. Both Washington and Beijing have been actively courting support from Asian governments and beyond, confronting smaller capitalist regimes with a ‘choice’ – which side are you on? Most would prefer not to choose. Earlier this year, Beijing threw a lifeline to Malaysian Prime Minister Najib Razak, who faces corruption charges, by pouring billions of dollars into scandal-linked government-owned investment companies. This move was widely seen as China “buying influence” over a government traditionally aligned with the US. The agenda of both sides is driven by their own great power interests, which pose a growing threat to the economic and security interests of the masses across the region. Global Times, a nationalist CCP-controlled newspaper, gives its view. The conflict took a new turn when president Obama visited Vietnam in May, lifting a 50-year old US arms embargo and paving the way for sales to Hanoi of patrol boats, anti-submarine airplanes, and possibly more advanced weaponry such as missiles and radars. Despite Obama’s explicit denials, the move was as Time magazine pointed out, “all about China”. There is speculation that a deal may soon be done for US warships to use Cam Ranh Bay, the strategically placed military port on the western edge of the South China Sea, which was a US naval base during the Vietnam War. The agreement with Vietnam follows the approval earlier this year by the Philippines supreme court of a military accord with the US (the so-called EDCA) that allows the former colonial power to station troops at bases it was forced – under popular pressure – to vacate in the early 1990s. Closer US-Philippines military ties are of particular concern to China, because this potentially positions US forces in bases overlooking some of the most hotly contested areas of the South China Sea. Since 2011, with the intensification of the conflict over the Spratlys, government agencies in Manila began using the term ‘West Philippines Sea’. The US is stepping up arms sales and joint military drills with the Philippines, but so is Japan (another former occupying power) which this year signed an agreement to sell military hardware and technology to Manila – the first such deal under Japan’s new military policy. Similar deals are being struck across the region, involving Australia, Malaysia, Singapore and Indonesia. This one example shows that Beijing, despite the bravado of its more nationalist media outlets, is under pressure to soften its stance. The CCP regime is likely to come under even greater pressure once the PCA ruling is announced and although it has made threats to speed up land reclamation and construction in the disputed waters, and even threatened to declare and air defence identification zone (ADIZ) over the South China Sea as it did over the East China Sea in 2013, a fresh diplomatic initiative from Beijing is perhaps more likely in an attempt to blunt the backlash its policies have generated. At the same time, a partial step back here is likely to be offset and disguised by applying pressure somewhere else – it is not accidental that China’s dispute with Japan over islands in the East China Sea is heating up just as the PCA tribunal is expected to deliver its verdict on the South China Sea. Hitherto, China has ruled out multinational talks – for example through ASEAN – over the disputed territories insisting instead on state-to-state diplomacy, a decidedly unequal arrangement. “China is a big country and other countries are small countries, and that’s just a fact,” as its former ambassador to the US, Yang Jiechi, bluntly stated. There are already some indications that Xi’s regime is modifying its position in anticipation of The Hague ruling, in order to limit its political fallout. The election of Duterte as president of the Philippines, a maverick populist with authoritarian leanings, opens a possible breach in the US-led front. Duterte has close links to Filipino-Chinese tycoons and sections of the capitalist class that benefited less from the policies of the outgoing, pro-US Aquino government. These layers are hoping Duterte will pursue stronger economic ties with China from which they hope to profit. Duterte says he is willing to take part in bilateral talks with Beijing over their maritime disputes, a departure from Manila’s (and Washington’s) current position. But Duterte is also highly erratic and hard to nail down to any clear policy. Like all the region’s leaders he also uses nationalism when this suits his purposes. During the election campaign he boasted he would personally ride a jet ski out to the Spratlys and plant the Filipino flag there. The Permanent Court of Arbitration will almost certainly rule against China’s claims. While the court’s rulings are not binding and Beijing has already dismissed the process as ‘illegal’, the outcome will be seized upon by Washington and its allies as a significant propaganda victory. Beijing’s response will play to deep nationalist sentiments inside the country against Western meddling and attempts to weaken China (which in this case are not completely wide of the mark). The US and its allies will use the PCA ruling to show that China is a bully that operates outside ‘international law’. Within the nations of the region the war of words will heat up putting even greater pressures on workers’ organisations and the left to stand out against the nationalist and militarist wave. “The first casualty of war is the truth” as the saying goes, and this applies to the verbal war between Washington and Beijing. The US claims to be ‘neutral’ towards the rival territorial claims while opposing the use of force by any country. But this ‘no use of force’ position is completely hypocritical from the state with the greatest war machine ever seen. US officials denounce China’s island-building but in fact all the claimant governments have engaged in similar activity, although the scale of China’s construction programme is bigger. The Hague ruling is premised on the United Nations Convention on the Law of the Sea (UNCLOS), an agreement that China has ratified but the US has never ratified (it has been blocked repeatedly by Republicans and a few right-wing Democrats in the Senate). This is despite the fact that the US, during Bill Clinton’s presidency, obtained special terms not enjoyed by any other signatory that amount to a veto over anything it dislikes. This of course fits a pattern of double standards by right-wing US politicians and governments who operate according to the principle “do as I say, not as I do”. This has seen Washington cold shoulder numerous global treaties such as the original Kyoto Protocol on global warming and the International Criminal Court against war crimes. Similarly, the US claim that it is defending ‘freedom of navigation’ is shot through with hypocrisy. More than a third of the world’s shipping passes through the South China Sea every year, including around US$5 trillion worth of global trade. This statistic is cited to support the US case for upholding freedom of the seas. But it is a fallacious argument as none of the conflicting territorial claims in themselves pose a threat to commercial shipping. Furthermore, the majority of this US$5 trillion in maritime trade is to and from China. The CCP regime is guilty of many things but hardly of wanting to disrupt its own seaborne trade routes. US aircraft carrier battle groups on an exercise in the South China Sea. For its part, Beijing bases its territorial claims on ‘historic rights’ backed up by old maps and documents and – ironically – by ‘Western’ dictated treaties vis-a-vis Japanese imperialism’s possessions surrendered at the end of World War II. This includes the Cairo Declaration of 1943 and the Potsdam Declaration of 1945, although there is no mention of the Spratlys or the Paracels in either document. The CCP regime’s ‘historical’ claims are not supported by real evidence. The disputed islands are uninhabited and so there is little hard historical evidence to support any of the claimant nations. The true history of the South China Sea is one of shared usage first by Malay, Arab and Tamil seafarers, and later by Chinese ships in or around the 10th century. The region’s history therefore speaks for a cooperative, shared approach to harnessing the sea’s resources. It does not lend support to the territorial carve up taking place today. The working class and all genuine left forces around the region must take an independent position, refusing to play the role of foot soldiers or apologists for any of the feuding governments. Socialists, the genuine left, take a position based on the interests of the working class and the poor which are international and not defined by nationality. We oppose the arms race and military escalation which is swallowing up precious public finances. Indonesia boosted its military spending by 16 percent last year, the Philippines by 25 percent and Vietnam by 7.6 percent. These are societies where the vast majority of people are still very poor and in desperate need of housing, free schooling, healthcare and urgent environmental action. In the Philippines there are four million children aged 6-14 years who do not attend school because of poverty. In Vietnam, more than a quarter of children under 5-years old suffer from malnutrition. What do they need with submarines? This is an imperialist conflict with both Washington and Beijing seeking to safeguard their interests in Asia through military and economic pressure. Socialists oppose the US ‘pivot’ and neo-liberal capitalist economic blocs such as the TPP, and call for the withdrawal of US forces from Asia. But we also oppose the Chinese regime’s military policies towards neighbouring states, which replicate the heavy-handed methods it uses against workers and the poor in China. Socialists support the right of self-determination for Taiwan, a key ingredient in the South China Sea conflict, while the CCP pursues an imperialist policy towards the island not fundamentally different from that of the US or Japan. The CCP’s warning that it is prepared to forcibly retake Taiwan in the event of a political crisis that threatens its interests (such as a declaration of independence), is also intended as a deterrent to the people of Hong Kong, Tibet and other rebellious regions. There is an urgent need for cooperative action across national borders to protect the fragile environment and reverse a disastrous depletion of fishing stocks. In the 1970s, the average daily catch of a Filipino fisherman was 20kg but this has fallen to 4.76kg, according to Straits Times (23 April 2016). Similarly, international cooperation is needed to arrest catastrophic climate change which will wreak havoc on the peoples surrounding the South China Sea especially in low lying coastal zones. Ironically, rising sea levels as a result of global warming could literally sink all the territorial claims in the South China Sea. But there can be no meaningful international cooperation on the basis of capitalism and imperialism. Instead, this system is leading us into national conflicts and future wars. Only the working class united across ethnic and national boundaries and organised around the ideas of socialism can offer an alternative to this mayhem. The socialist answer to the rival territorial ambitions of the region’s anti-working class regimes is for joint ownership, under democratic control and management by the peoples of the region, based on destroying capitalism and militarism and replacing them with a socialist society grounded upon international solidarity. We stand for shared and planned development of the disputed waters under the democratic control of the people of China and Southeast Asia through the framework of an Asian socialist confederation.